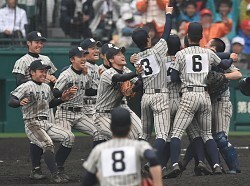 NISHINOMIYA, Japan (Kyodo) -- Tsuruga Kehi of Fukui Prefecture won its first high school national invitational championship, defeating Hokkaido's Tokai Daiyon 3-1 in the final Wednesday. In a game that started late on account of rain, Tsuruga Kehi's Teppei Matsumoto broke a 1-1 tie in the bottom of the eighth inning with a two-run home run. It was Matsumoto's third home run of the tournament.